Eden Hazard has teased Tottenham over its lack of silverware as Chelsea hunt Mauricio Pochettino's side in the race for Champions League qualification. Spurs opened their new home, Tottenham Hotspur Stadium, with a 2-0 win against Crystal Palace on Wednesday, ending a run of four defeats and a draw from their preceding five Premier League games. Third place is still occupied by Spurs despite their slide but Arsenal and Chelsea are only a point behind, with Manchester United two further back after losing 2-1 at Wolves this week. And Hazard, a two-time Premier League champion with Chelsea, took the opportunity to fire a barb at Tottenham over failing to convert its undoubted development into trophies. "I think Tottenham, for two or three years, have been one of the best teams in England," said Hazard, who has also won the Europa League, FA Cup and EFL Cup during his time at Stamford Bridge. "That is for sure. I don't like that, to be fair – we are Chelsea, and it is a big derby against them – but we have to accept it. "For the Premier League it is good: a new stadium, they have top players. "But, in the end, you know at Chelsea we have won a lot of trophies, and they have not. So I hope this continues." Chelsea's form has been patchy with the future of Maurizio Sarri in doubt, but Wednesday's 3-0 home defeat of Brighton and Hove Albion made it back-to-back Premier League wins for the Blues. 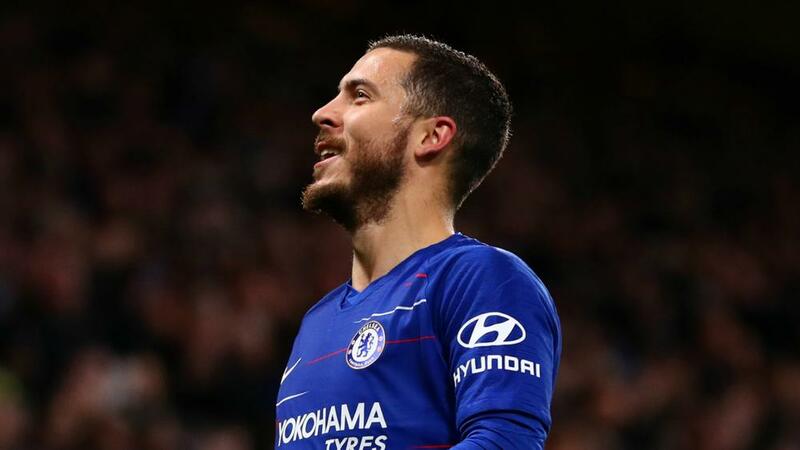 After Monday's game against West Ham at Stamford Bridge, Chelsea face trips to Liverpool and United in their next two away league fixtures, but Hazard is happy to be chasing a top-four finish. "People are not talking about Chelsea for the top four and I like that," said the Belgium forward. "We are quiet, in fifth or sixth, and then we can just be ready for the next game. We want to go game after game. "We have hard matches coming up against Liverpool and Manchester United, but Chelsea is a top club. "We like this challenge so we will go to these teams and try to win because, at the end, we want top four."